A young man who burgled his neighbour’s home whilst two young children slept in their beds was handed a 21-month sentence on Wednesday. As well as targetting his neighbour’s North Belfast home, Tiernan Og McAteer refused to leave the premises when confronted by the male occupant, who he then assaulted. The 18-year old appeared at Belfast Crown Court and was told by Judge Gordon Kerr QC that he will serve half his sentence in custody, with the remaining half spent on supervised licence upon his release. McAteer admitted three offences arising from the early morning break-in, namely burglary, criminal damage and assault. 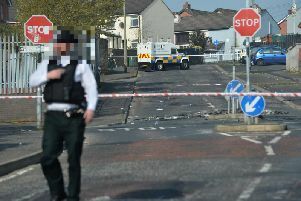 Co-accused Lee Martin Patrick Lindsay (23) from Glenard Brook in Belfast, appeared alongside McKenna and admitted a charge of handling stolen goods, after he was caught close to the targeted property with a 42-inch TV which had just been stolen. He was handed a 12-month sentence which will be split between six months in custody and six months on licence. Crown prosecutor David McClean told the court that in the early hours of June 26 last year, a family including two children aged five and eight were asleep in their Oldpark Square home. At around 2.30am, the male occupant was woken from his sleep to find a male intruder in his bedroom holding a 27-inch TV which had been removed from his son’s bedroom. He shouted at the male intruder to get out of his house, which woke his wife. The female occupant was able to identify the intruder as her neighbour Tiernan McAteer, who at the time of the burglary also lived on Oldpark Square. When he was confronted in the bedroom, McAteer ran down the stairs, dropping and smashing the TV in the process. He then ran into the kitchen, and when he was confronted again by the male occupant, McAteer kicked him twice. McAteer then fled the house, while the occupant realised a 42-inch Samsung TV was missing from the living room. He also noticed that an X-Box has been moved, and the kitchen floor was flooded. Upon further investigation, officers located the 42-inch TV which had just been stolen from Oldpark Square. Both McAteer and Lindsay were arrested later that day. A barrister representing McAteer spoke of her client’s young age and revealed that due to the “very significant difficulties” in his life, he had spent most of his teenage years in custody. She also revealed that since becoming a father, McAteer has expressed awareness regarding his offending and spoken of moving from the area to remove himself from association with “others who assist him with his offending”. A solicitor for Lindsay also spoke of difficulties in his life, including “substance abuse and misuse”, and revealed that at the time of the break-in, Lindsay “had taken a large amount of Diazepam and his thinking was distorted”. The solicitor said Linsday admitted a single charge of handling stolen goods - namely the 42-inch Samsung TV - but had not entered the house, and therefore planned a “secondary” role.